Special thanks to Janxden Greenlife for extending this food review invitation. 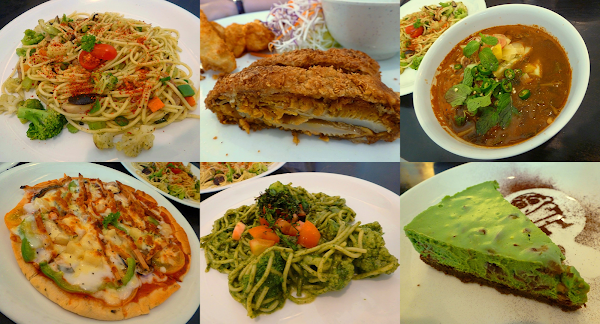 Located at Jalan Chow Thye and opposite of Yella Fork, Janxden Greenlife is a vegetarian restaurant which focuses on contemporary Western-style dishes. This is one of the two outlets presently; the other outlet is located at All Seasons Place. Unlike many vegetarian restaurant, Janxden Greenlife does not use gluten as an ingredient. Soy pulp is used instead. Food is cooked using olive oil, but palm oil is also available upon request. Certain dishes may contain egg or milk, so vegan customers should enquire before placing orders. Freshness is of utmost importance at Janxden Greenlife. Nearly every ingredient is prepared from scratch in the kitchen. The restaurant relies on natural flavoring and abstains from using artificial flavoring such as MSG. The first dish is Mushroom Chop (RM17.90), which I think is the main highlight today. The fillets are made from slices of fresh mushroom with spicy seasoning in between. Battered with oat crumbs, the fillets are delightfully crispy. A bowl of cream roux on the side serves as dipping sauce. The sauce is whipped well and is very light on the mouth. In addition, there are fried potato wedges on the side. I cannot recommend this dish highly enough. The next dish is Aglio-Olio (RM13.90) from the pasta menu. The spiciness of this dish comes from crushed red pepper and bird's eye chili. Pasta itself is mild in terms of flavor, therefore it has to rely on vegetables such as broccoli, cauliflower, carrots and bell peppers for some sweetness. A non-spicy version of Aglio-Olio is also available for customers with milder palate. Another highlight during this meal is Pesto Pasta (RM13.90). Pesto sauce is an Italian dressing made from basil leaves, salt and olive oil. Although pesto sauce is creamy, it does not feel surfeiting at all. The scent of basil may be overwhelming for some people, but I think this dish handles this matter quite well. The Hawaii Pizza (RM17.90) uses a thin crust similar to New York's. Pizza dough is prepared fresh in the kitchen, as opposed to frozen, ready-made ones. Pizza toppings include pineapples, tomato, eggplant, bell peppers, mayonnaise and mozzarella cheese. In particular, I like the taste of fresh tomato sauce that act as glue between the crust and pizza toppings. From time to time, the restaurant introduces new dishes on seasonal basis. The special dish today is Laksa (RM8.90). Compared to the authentic counterpart, this vegetarian version faces the difficulty of emulating the pulpy texture of fish in the broth. I also feel that the dish is too spicy for me; perhaps the amount of bird's eye chili should be toned down. Organic Black Sesame Doufu Hua (RM9.90) has smooth and silky texture. I am surprised by the absence of "grainy" coarseness that is often associated with ground black sesame. The dessert is reasonably sweet on its own, so I prefer not to add any brown sugar syrup that comes in a separate cup. Green Tea Cheese Cake (RM8.90) uses cookie crumbs as the base, followed by Philadelphia cream cheese that is flavored with green tea powder. This chilled cheesecake littered with cooked red beans, giving this dessert a lovely hint of sweetness. This cheesecake does not contain any eggs. As for drinks, there are a number of fresh mixed fruit juice on the menu. For example, Applejito (RM9.50) is made from apple, lemon and mint. Purple Valentine (RM8.90) contains beetroot, apple and celery. Finally, Buttersweet Memory (RM8.90) is a mixture of bitter gourd and honey. For customers' convenience, Janxden Greenlife is open on the 1st and 15th day of each month in the Chinese calendar, even if the day happens to fall on a Wednesday. The restaurant is quite popular among vegetarian and non-vegetarian customers. In fact, new customers are often surprised when told that the food is vegetarian in nature. Directions: From Burmah Road (Jalan Burma), turn right to Service Road (Jalan Servis), then right again at Irrawaddy Road (Jalan Irrawadi). At the next crossroad, turn right again to Chow Thye Road (Jalan Chow Thye). Janxden Greenlife is one of the shops on the right. Parking is available within its compound.